SAN JOSE, Calif. /California Newswire/ — The "Brain Works" sculpture in San Jose, is the latest public art installation for artist Marta Thoma Hall, who is also president of Velodyne Acoustics, Inc. For Hall, the process of designing a new line of headphones or subwoofers is no different than creating, say, a piece of sculpture. A very large piece of sculpture. 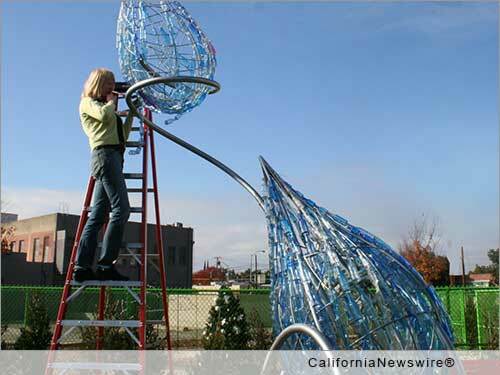 Recently, Hall completed "Brain Works," a 30-foot tall sculpture for Bestor Art Park located in the Martha Gardens neighborhood of San Jose. In 2010, the City of San Jose held a competition to create a landmark sculpture for the neighborhood, and Hall's design was selected. "Brain Works is a tribute to the San Jose Arts Community. After the sculpture was installed, it looked to me like a flower. I had a neck and brain in mind," said Hall. One can imagine the tall poles represent a neck leading to shoulders and a head made of coiled steel. Smaller steel branches hold a web of recycled glass bottles and a network of spoons. The composition is plant-like and suggestive of energy flow. Hall's "Brain Works" is only the latest in a series of commissioned sculptures made of recycled and unexpected materials. Other Thoma Hall installations include: "Cosmos Clock" for Florida State University, "Water Source" for the Water Park in Goodyear, Arizona, "Inside Out," at Vertigo Gallery in London, "Stretch" at the Costa Rica Museum of Art, and "Journey of a Bottle" in the Walnut Creek Main Library. Marta Thoma Hall leads Velodyne Acoustics Inc. along with Inventor and CEO, David Hall. "David and I have a mutual enthusiasm for new ideas. I approach industrial design as sculpture and think about composition, shape, and materials. The process is the same whether you are designing a 30-foot sculpture or a pair of headphones," said Hall. She added, "David has been inventing groundbreaking robotic technology. Working with David inspires me to push the limits of design." Hall created a family of headphones for Velodyne that include Bluetooth and noise cancelling features. The headphones can be customized with an array of headphone covers with artistic and leather designs. See http://www.velodyne.com/ . Founded in 1983 and based in California's Silicon Valley, Velodyne Acoustics is a technology company known worldwide for its audio equipment and LiDAR sensors. LiDAR is sold for applications including autonomous vehicles, aerial UAV navigation, and more. See http://www.velodynelidar.com/ .